Consumated in Philadelphia, Pennsylvania September 5, 1999. John Morris, who currently doesn't know for sure where he lives, telephoned Bull several weeks ago. 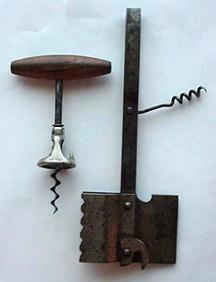 In his quest to find every American patent corkscrew for his collection, he had learned that Bull had a duplicate of John Murphy's 1901 patent (left in photo). Morris was willing to trade heavily for it. Bull also revealed that he had a combination corkscrew, can opener, meat cleaver, and meat tenderizer available for trade. This tool is marked PAT. PENDING. After considerable verbal wrestling, Morris offered the four knives shown below. Both parties agreed and the exchange was ultimately made when both were in Philadelphia for the ICCA meeting. 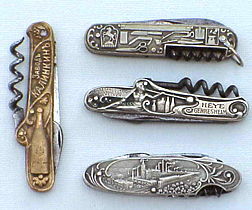 Left photo: The brass handle knife on the left advertises Russia's Kalinkin Brewery with factories in Petersburg and Moscow. 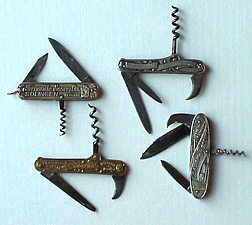 The knife showing a variety of tools (top of row) advertises "Fernado Esser & Cia., Solingen, Germany. In the middle of the row is a knife commemorating the production of 165,000,000 bottles by the Ferd. Heye Glass Works. At the bottom of the row is a factory scene knife for Thurm u Beschke, producers of Lacquers in Magdeburg, Germany. Right photo: All four knives opened. So the deal was done! What do you think? Email your opinion to corkscrew@bullworks.net or leave your opinion in the guestbook. Refer to MORRISBULL TRADE and indicate A, B or C.
Frank Ellis: From my viewpoint young Morris won by a mile - but then I don't really rate knives! Lynne Balvin: Bull definitely defeats Morris hands down. Those knives are beautiful, there is NO contest. I think you are taking advantage of your friends, and I am never trading with you.